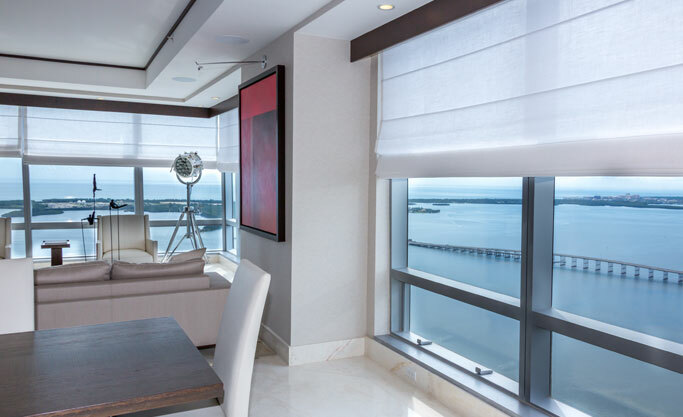 Remote controlled blinds and shades are a great option for those hard to reach windows or those with very wide dimensions. Convenient, simple to use, and practical, our roller shades gives you the option of having your blinds fully automated. You will open and close them at the touch of a button from a wall switch or from the comfort of your sofa using a remote control. Hitech-shades will integrate your shades with your home automated system coordinating all your security, lighting, air conditioning , shutters and windows. We will help you maximize the thermal comfort adding sensors and timers so your roller shades will work even when you are away. Impress your friends with our ultra-quiet motors and sophisticated blind systems. Available with remote control, integrated to your home automated system or wired to a wall switch. All of our shades are hung and tested before shipment and handcrafted in USA.